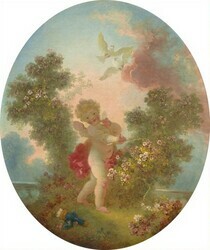 Richard Rand, “Jean Honoré Fragonard/Love as Folly/c. 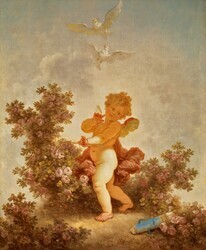 1773/1776,” French Paintings of the Fifteenth through Eighteenth Centuries, NGA Online Editions, https://purl.org/nga/collection/artobject/52255 (accessed April 24, 2019). Given the numerous versions of this painting and its pendant, Love the Sentinel (NGA 1970.17.112), it is difficult to establish their early provenances. 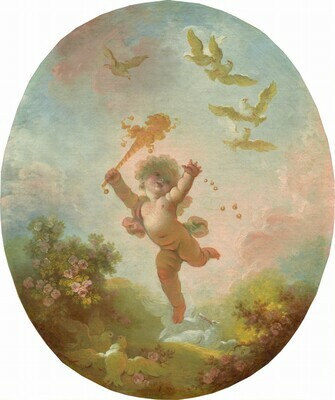 Although Georges Wildenstein, The Paintings of Fragonard, New York, 1960: 271, listed the other NGA pair (NGA 1947.2.1 and NGA 1947.2.2) as appearing in the Véri sale in 1785, Roger Portalis, Honoré Fragonard: Sa vie et son oeuvre, 2 vols., Paris, 1889: 2:270, associated this painting and its pendant with that sale. The "C" number that appears on a label on the reverse of the painting likely indicates that the painting was in the hands of M. Knoedler & Co., whose stock numbers for objects on consignment took this form. Mellon could well have purchased the painting from this dealer (by 1934 when he lent it to a San Francisco exhibition), or at some point during his ownership he may have attempted unsuccessfully to sell it through Knoedler's. Three French Reigns (Louis XIV, XV & XVI): Loan Exhibition in Aid of the Royal Northern Hospital, 25 Park Lane, London, 1933, no. 119, repro. Exhibition of French Painting from the Fifteenth Century to the Present Day, California Palace of the Legion of Honor, San Francisco, 1934, no. 28, repro. French Painting and Sculpture of the Eighteenth Century, The Metropolitan Museum of Art, New York, 1935-1936, no. 48, repro. Fragonard and His Friends: Changing Ideals in Eighteenth Century Art, Museum of Fine Arts, St. Petersburg, Florida, 1982-1983, no. 21. Wildenstein, Georges. The Paintings of Fragonard. New York, 1960: no. 321, repro. Mandel, Gabriele. 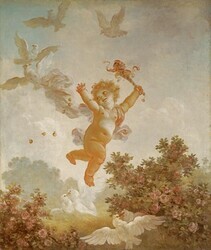 L'Opera completa di Fragonard. Milan, 1972: no. 345, repro. Walker, John. National Gallery of Art, Washington. Rev. ed. New York, 1984: 338, no. 453, color repro. Conisbee, Philip, et al. French Paintings of the Fifteenth through the Eighteenth Century. The Collections of the National Gallery of Art Systematic Catalogue. Washington, D.C., 2009: no. 32, 167-172, color repro.